Planning is the foundation for pursuing your art therapy business goals. Once your goals are set, you need a system in place to help facilitate action. This is where using the right planning tools can help you improve your art therapy business in a variety of ways. The type of planning tools you use will depend on the activities you engage in with your business. If you only deliver therapy services then you can choose tools that help plan appointments and client management. If you also write blog content, sell ebooks and conduct workshops online, there are a number of other tools that are specific to those tasks. You can run the risk of having too many tools to manage, however, fortunately in this technology driven era, there are tools that can help you create comprehensive plans in different areas of your art therapy business in one application. 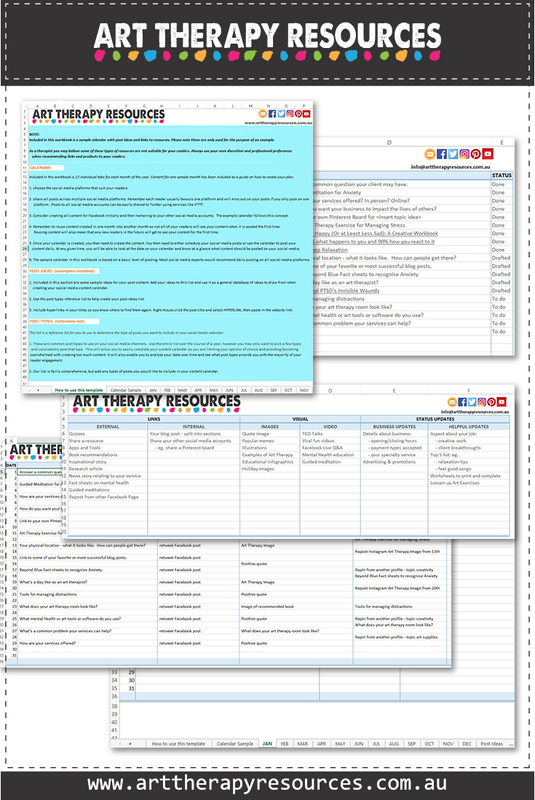 We’ve created a list of 10 tools that can be used for planning in your art therapy business. Excel is typically used with anything involving numbers and calculations, however, it can also be used as a useful planning and scheduling tool. This is primarily because of its structure using rows and columns which will allow you to easily enter and manipulate data. Excel is available for use across a variety of platforms including desktop and tablets. 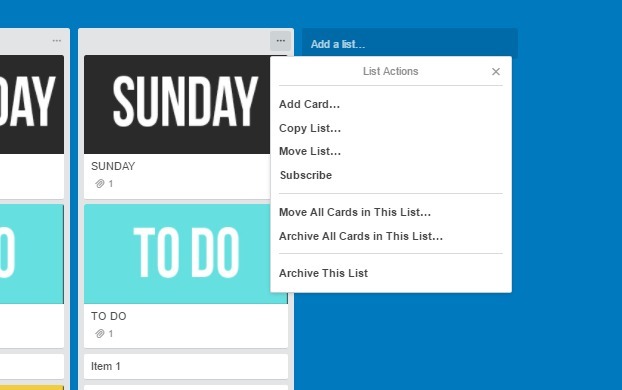 Trello organises your projects and tasks into boards using cards. The best offline comparison to how Trello works is to imagine using sticky notes on a pin board. It is great for users who like to view their projects visually. Following on from the pinboard/sticky note comparison, you can easily move your Trello cards around on your project board so that you can keep your workflow and progress organised. Individual Trello cards can contain a lot of information including images, attachments, checklists and deadlines. 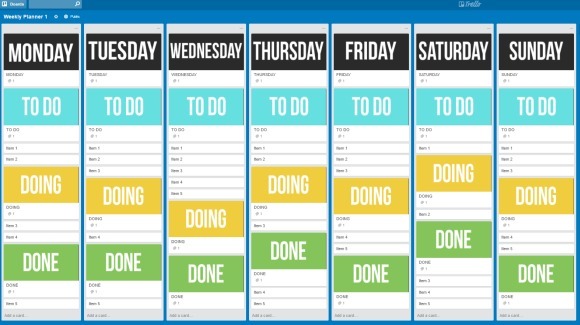 Trello can be used on a project by project basis or as a weekly calendar with daily tasks. You can also use templates created by other users. Trello also has an active blog where the company provides useful tips and ideas on how to manage your Trello planning process. Trello is a web application tool so can be used on your desktop as well as on mobile devices. Because it is a web application you will have access to your Trello account and boards anywhere as long as you have an internet connection available. This also means that you can share and collaborate with other users. Trello is free and also provides an upgrade service for additional features. 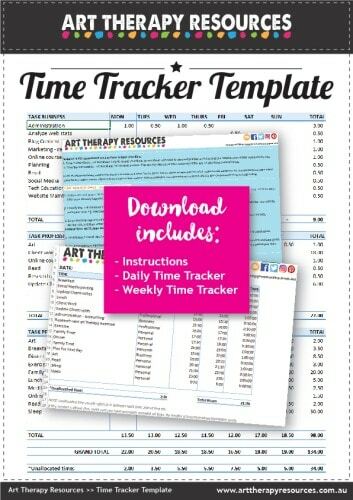 The free version will provide all the features that you need to effectively use it for your art therapy business planning purposes. You can use these inspiring Trello boards as a template for your next project or use them as inspiration to incorporate some of the ideas into your own Trello set up. We’ve created a FREE Trello board template for you based on a weekly layout. We’ve included image labels for each heading as well as some blank cards to get you started. If you just want to use this board for a 5 day work week, delete all of the cards that are showing in the Saturday and Sunday columns. To do this, click on the menu button in the right hand corner of each column and select ARCHIVE THIS LIST from the bottom option. 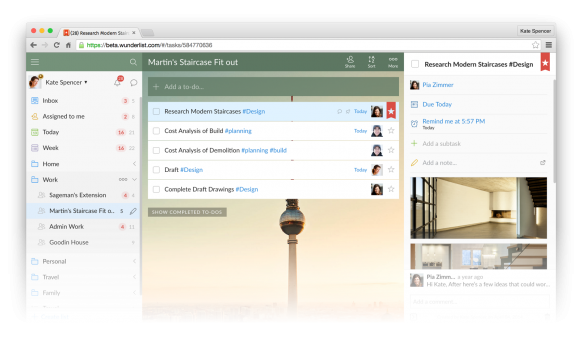 Wunderlist is a web-based to do list. It is great for keeping a simple actionable list that doesn’t require complex task managing. Wunderlist has a number of useful features that make to do lists more useable including reminders, sharing and copying. You can also email and print your lists if you want to work with a physically printed list during the day. Because Wunderlist is web-based, it syncs over any of your devices while connected to the internet. This eliminates the need for carrying notebooks. 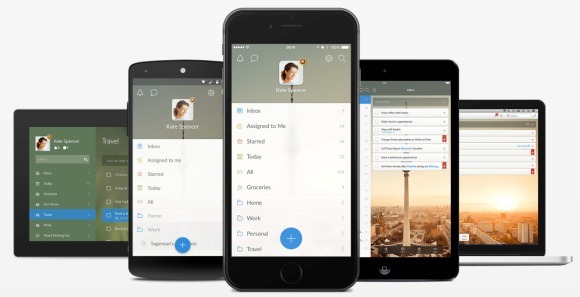 Wunderlist is free and has upgrade plans for extra features. 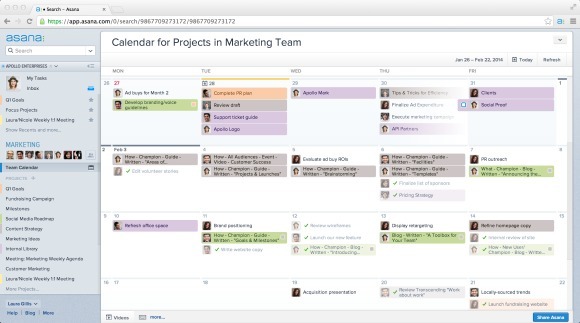 Asana is another project planning tool that is similar to Trello. 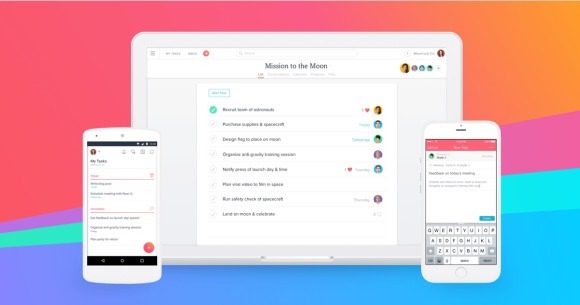 It’s design and interface is more list based compared to Trello’s visual pinboard style, however, Asana is embracing the card system also. Asana provides a variety of templates to get you started. Asana has limited templates in the free version, however, the upgraded paid version offers more templates to use. You can use Asana to plan your day or create a workflow for a single project. Scrivener is known more for its robust writing features and doesn’t have the same workflow and planning features that a program like Trello or Asana can provide. Where it beats other planning software is in its design focus around long form writing such as blog posts, ebooks or course/workshop content. Most users of Scrivener would it to create content once your master business plan is created. As a writing tool, it provides more planning features than other writing programs such as Microsoft Word. 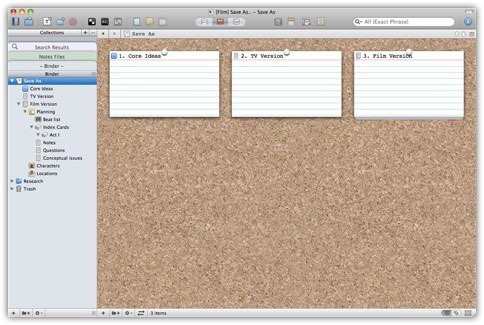 Scrivener has its own corkboard system built in to allow you to plan writing content and stay up to date on drafts and finished writing projects. 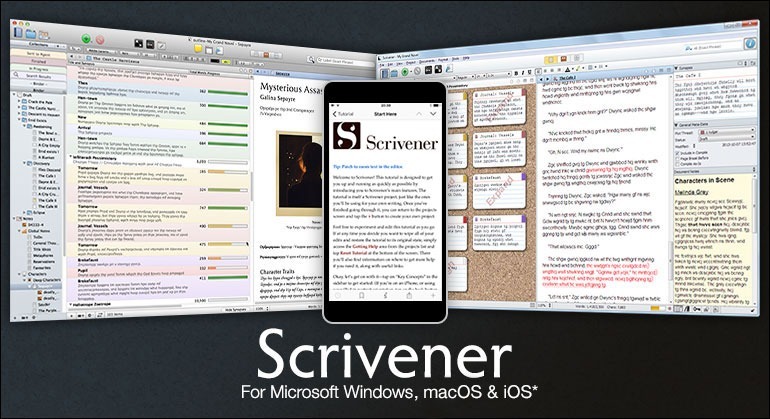 Scrivener is a paid product and is worth every cent in my view! 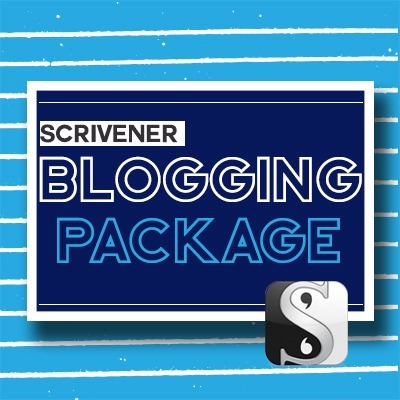 ￼If you need help to develop your planned content, we have a Scrivener Blogging Package available in the store. 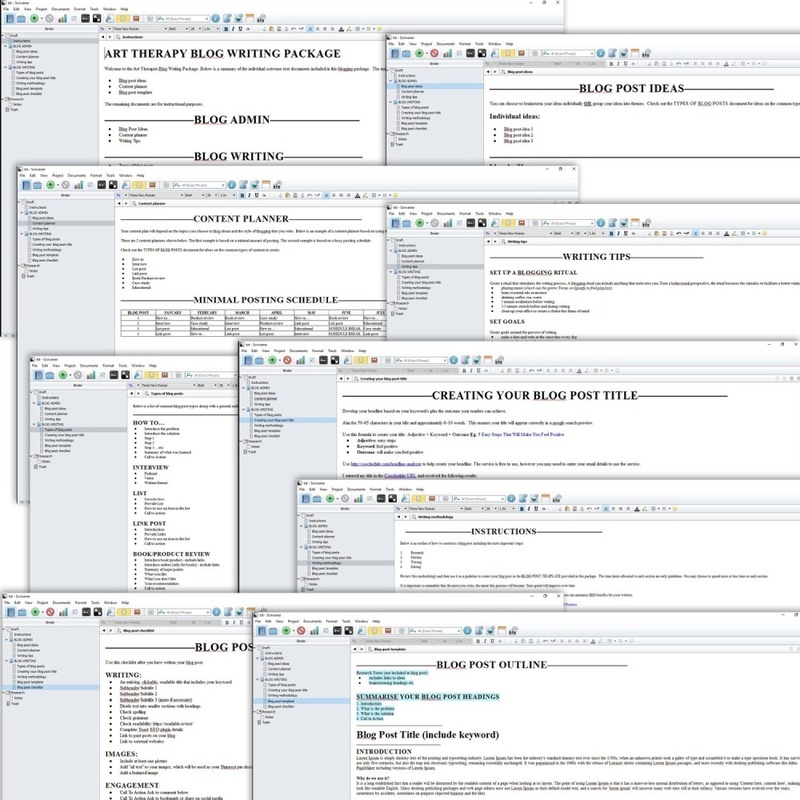 Below is a snapshot of the content within the Scrivener Blogging Package. You can find more details on the package on our website here. The package provides the foundations of the most common type of blog posts that would suit a therapist. Once you’ve selected your type of blog post, you can use our step by step formula to create your title and blog post content. 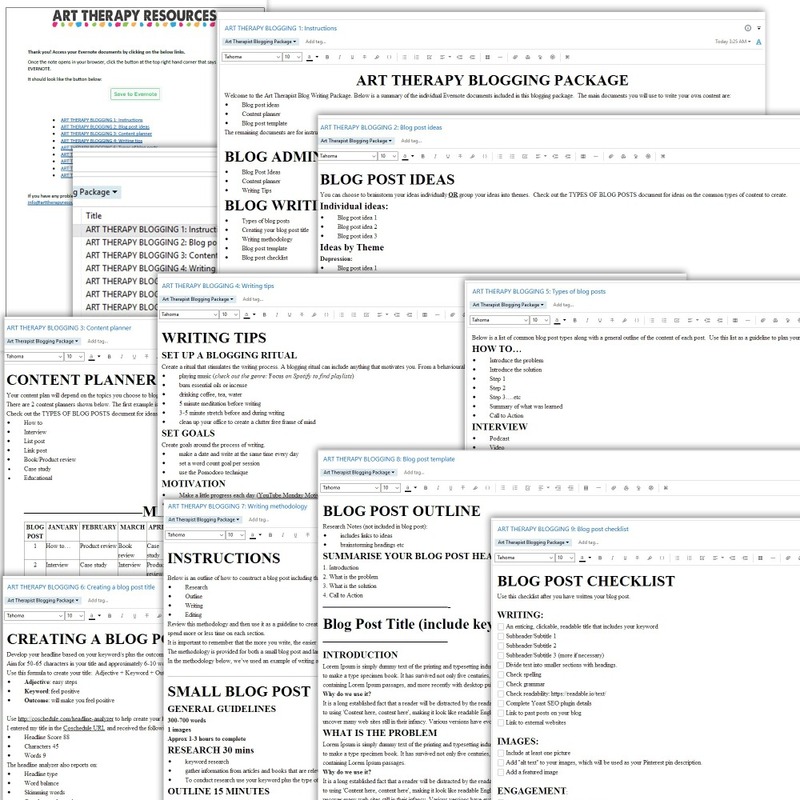 Using the resources in this package makes the process of blogging so much easier. It will save hours of wasted time trying to construct the perfect blog layout. This templates is created for use in Scrivener and is imported into your Scrivener Project. All sections are arranged within the Scrivener structure of folders and text documents. Evernote is similar to Scrivener as it is also used as an excellent writing tool, however, it has extra features that enable it to be used in a planning capacity for your art therapy business. You can send information directly from the internet into your Evernote documents. You can share documents privately and publicly and as it is a web-based program, your data is synced so that you can access your account across multiple devices at any time. 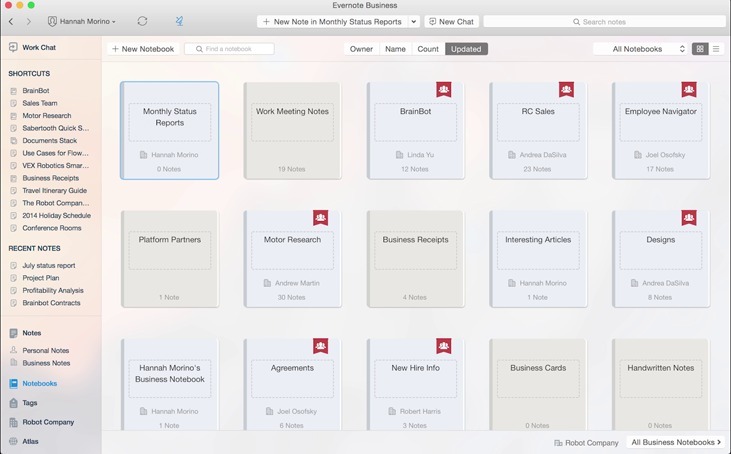 Evernote’s organisation system is based on notebooks which are similar to folders. This allows you to organise your notes according to a project and keep sections well defined with individual notes. Evernote also has some other useful planning type features such as reminders and checklists. 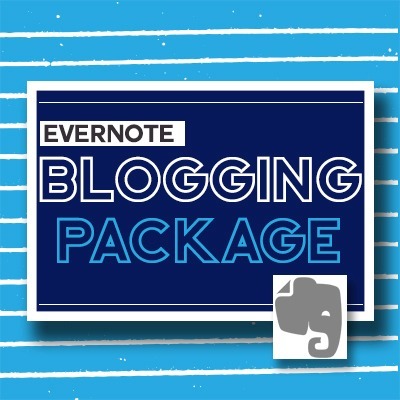 ￼If you need help to develop your planned content, we have an Evernote Blogging Package available in the store. Below is a snapshot of the content within the Evernote Blogging Package. You can find more details on the package on our website here. This product purchase is a collection of Evernote documents to be saved in your Evernote program. 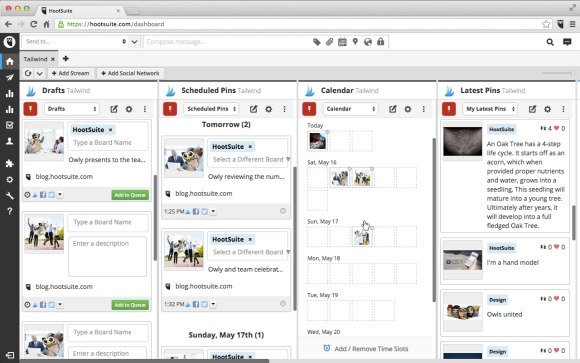 Hootsuite is purely a social media planner so once you’ve created your business plans using the other tools in this list, you can use Hootsuite to help schedule your social media posts. Hootsuite does provide a free version, however, more features are available in the paid upgraded plans. In the free plan, you have a limited number of social profiles that you can add to your account. You can also access basic analytics and content scheduling. 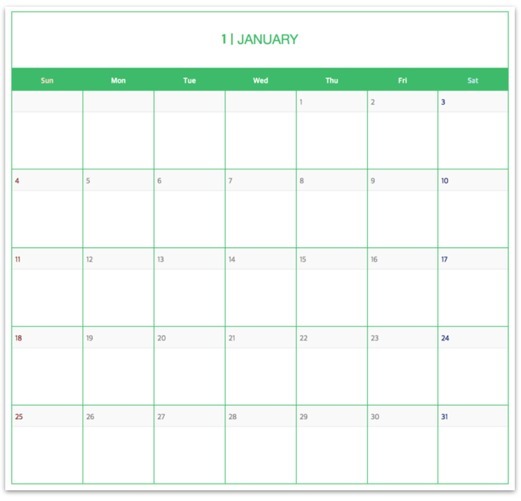 Google Calendar provides a standardised calendar system for your planning requirements. 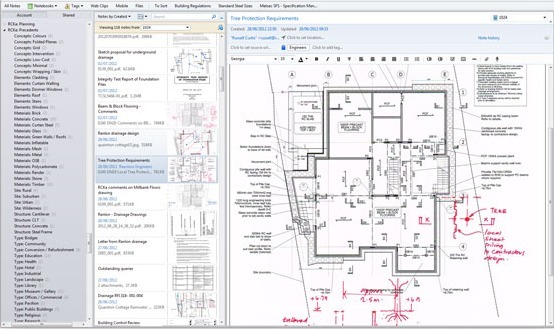 As it is web-based, you can also have access to your planning information across multiple devices with an internet connection. 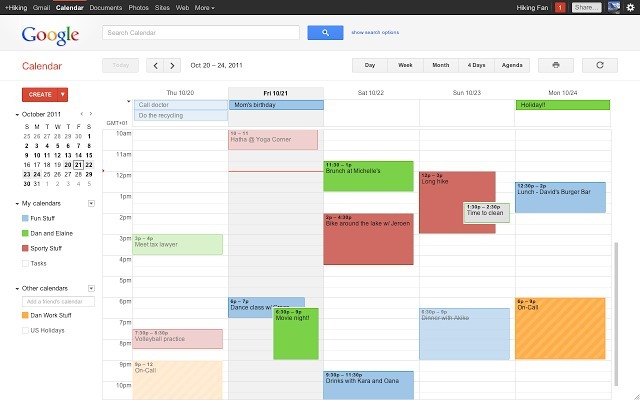 Google Calendar is free and integrates with other Google products including documents and gmail. You can utilise monthly and weekly views for an overview of your planning process. Google calendar also allows for sharing and collaboration and provides you with reminder options to stay on track with your planning. We’ve discussed IFTTT in a previous blog post reviewing social media schedulers. 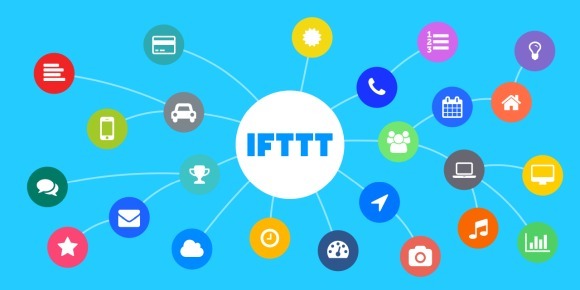 IFTTT is an automation tool that provides a communication channel between your software, tools and apps. The name is an abbreviation for If This Then That. For eg, IF I post an article to my blog, THEN, share it to my Twitter Page. IFTTT requires you to create a recipe which details the trigger (a post to my blog) and then what the following action is (share to my Twitter page). You can create your own recipes or use recipes that other users have created that are available for public use. Following on from IFTTT is a similar program called Zapier which creates automation processes that help you action your plans. 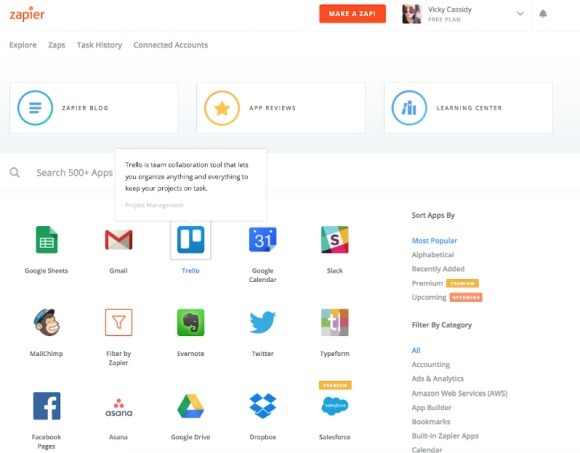 Zapier offers more complex connections amongst your external programs than IFTTT, however, this can sometimes result in a steeper learning curve. Zapier currently has more integrations than IFTTT, however, for the purposes of an art therapy business, both services offer more than enough integrations. Zapier does have a free plan, however, more features are available in upgraded paid plans. 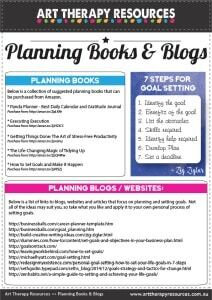 Download the resource sheet of useful planning books and blogs. 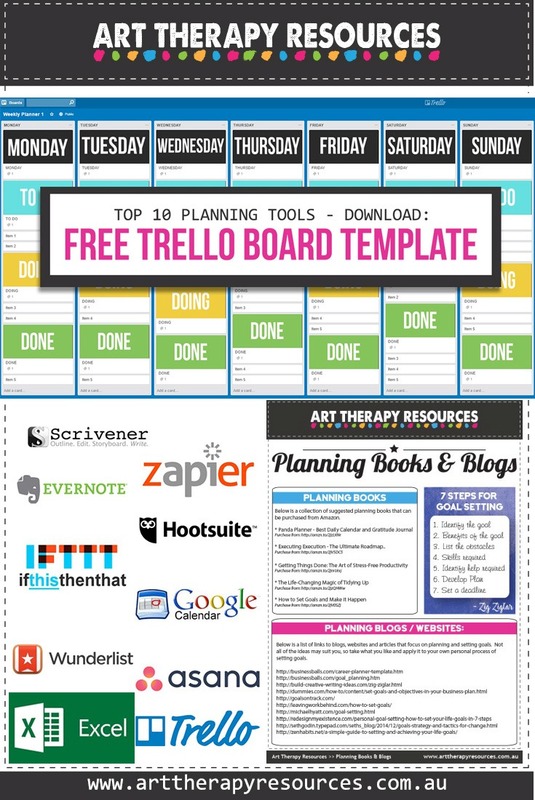 Don’t forget to also download the FREE Trello Board template here.